With its unique, almost fluid silhouette featuring softly sloping arms complementing subtly contoured cushions, the Parker Sofa provides sense of stylish serenity in the modern space. Meticulously upholstered in Luxe Soft Weave fabric, the Parker Sofa is available in an array of pastel hethered shades that serve to further promote this sofa's placid aesthetic. Bench-made of quality materials by skilled craftsman. Elegant yet easygoing silhouette for the contemporary aesthetic. Your choice of eye-catching colors. Expertly upholstered in Luxe Soft Weave fabric which is a heathered plush upholstery that features a smooth textured weave with a luxe, flanneled finish. Fabric is soft to the touch with a clean, elegant look. Cushions are topped with an extra layer of memory foam for added comfort. Never had a sofa with memory foam before, COMFORT GALORE! Pretty easy to put together too! Purchased in light gray! LOVE IT!! Color and sloping armrests are elegant ! Love the simplicity of this piece. It's comfortable and looks great. Legs add a cool detail. ProsSo far everything is great! Bought this in the lime green color and it is awesome! Love everything about my new sofa and love Inmod's customer service too. I was in desperate need of a new sofa and had been looking for some time. I came across Inmod and found exactly what I was looking for. Sight unseen can be scary but I am so happy I took the chance. Perfect. ProsGreat color and style. Understated but comfortable to relax on. Will definitely be back. 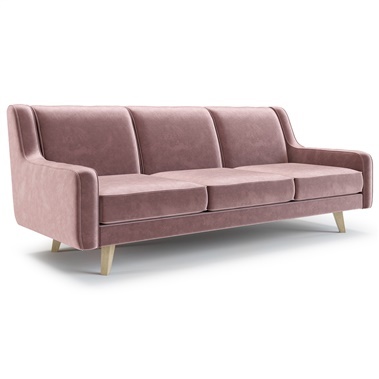 Hos to get color swatches for this couch? Also details of construction? We are happy to send you swatches. Please respond back to us with your address and the colors you would like to see and we can have them sent out right away. 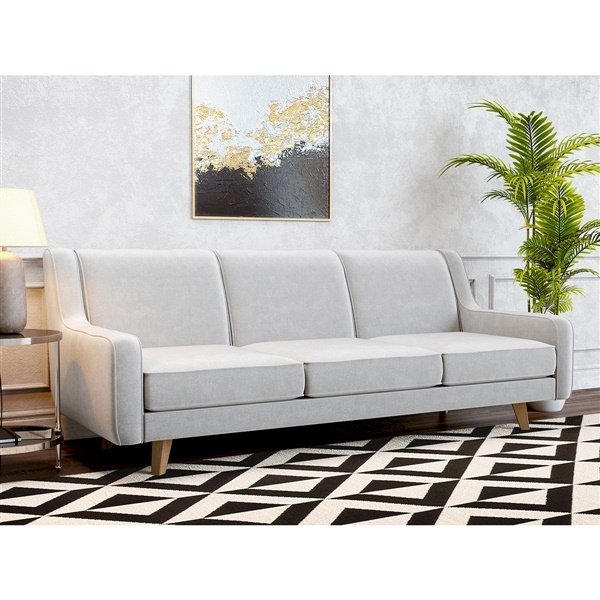 This is a quality made sofa with a wood frame, sinuous springs for support, medium density foam with a layer of memory foam for extra comfort.